While people’s trust in news media in the United States and around the world continues to fall to record lows, The Epoch Times stands out as a superhero for journalism. 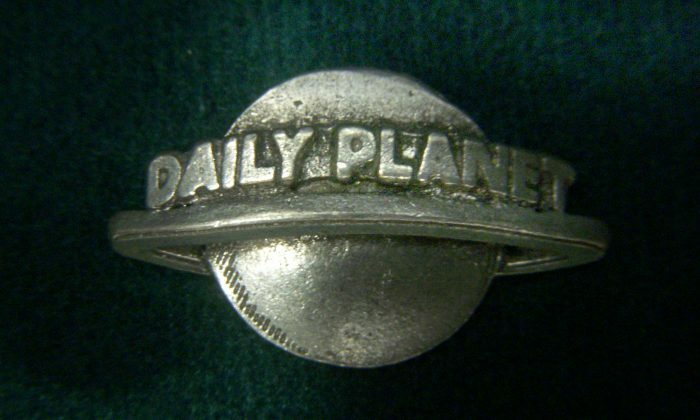 The “Daily Planet” has long been considered one of the most iconic fictional newspapers in the world of movies and television. It’s a place where hard-working journalists such as Superman’s alias Clark Kent work for a publisher that may act stern, but has integrity, and who won’t back down from printing the truth even when the paper is threatened. The fictional newspaper first appeared in 1940 in the “Superman” radio show. In those times, it was clear who the good guys were and who the bad guys were: those who upheld traditional laws, and those who broke those laws. But now, it’s not so easy anymore. That’s why The Epoch Times was founded. Like “Superman” and the “Daily Planet,” the founders of The Epoch Times wanted to fight evil, expose crimes against humanity across the globe, and tell the truth. Its journalists work hard to uncover all the pieces of the puzzle before they present the public with uncensored and unbiased news. The old adage “the pen is mightier than the sword” duly applies here. Decades ago, the United States faced grave threats from the oppression of communism spread with the help of the Soviet Union. The Cuban Missile Crisis was the crescendo of this battle. Needless to say, good won out. But freedom does not come free. It comes at a price. And the media must help the public understand that price if nations such as the United States are to keep their freedoms of speech, religion, and the press. Its citizens will then become more hopeful and have peace of mind, because they can accurately understand how their country and their lives relate to the state of affairs in the world at large. President John F. Kennedy gave a speech in 1961 following the Bay of Pigs episode, one year before the Cuban Missile Crisis. At that time all Americans stood tall together against the tyranny of this crisis, knowing full well what a bad outcome would mean for the country, themselves and their children. “The President of a great democracy such as ours, and the editors of great newspapers such as yours, owe a common obligation to the people: an obligation to present the facts, to present them with candor, and to present them in perspective. It is with that obligation in mind that I have decided in the last 24 hours to discuss briefly at this time the recent events in Cuba,” said Kennedy. This same obligation and great responsibility is now being upheld by The Epoch Times. One of the greatest examples is the newspaper’s dedication to expose the lies and criminal deeds that the Chinese Communist Party (CCP) has committed over the last several decades and which continues today. Although the CCCP of the Soviet Union has fallen, China’s CCP still remains, and its brand of tyranny is not always easy to see. The mainstream media does occasionally report on political or religious dissident persecution in China, and the State Department has listed China as one of the worst human rights abusers in the world. The U.S. government has also passed resolutions such H. Res. 343, which exposes and condemns the CCP’s state-sanctioned illegal organ harvesting of live Falun Gong practitioners. However, when asked, most Americans and many people around the world have little knowledge of any of these crimes against humanity. Why? Because major media groups have not performed their obligation and responsibility to report them in a timely, comprehensive and truthful manner to the public. We must ask ourselves: Is China’s communist regime our friend or our foe in the fight against evil? This is not so easy to differentiate. One reason for this is that many media groups and companies around the globe have their hands deep in Chinese pockets. In addition, the CCP coerces and threatens many governments and corporations to not expose their lies and crimes to the world, or they will drop all business relationships and capital investments. But one media that shines brightly through all of this has been The Epoch Times. The Epoch Times started exposing the Chinese regime’s crimes and clandestine operations 17 years ago, and it hasn’t stopped since. As a result, the Chinese edition of The Epoch Times has become the most trusted Chinese paper in the world, and the English version is growing exponentially. Because of The Epoch Times’ tenacious objective journalism, we have finally been able to see how the Chinese government and other communist influences have been able to affect and shape the world’s politics, economy, and society. Although its methods have been difficult to identify, The Epoch Times has been working relentlessly on this since its inception. A truly upright and positive media group needs to have the philosophy of helping people, bringing people closer together, and helping people to have more faith in decent countries’ governments. This uplifts them and gives them hope, instead of dissension, confusion and chaos.